This is what trainspotting looks like in the largest, coldest desert in the world, where temperatures reach –80°C and the nearest human beings are over nearly 400 miles away. The European Space Agency has just released this mesmerizing video of this caravan on skis, which brought supplies a year ago to the Concordia research station in Antarctica. They call it "Raid," and it is supplies Concordia with heavy cargo. 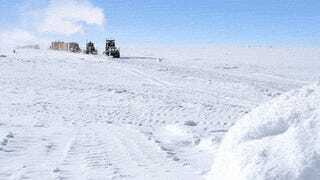 The trek is over 600 miles long, with tractors pulling a line of sealed containers across the white desert of Antarctica. The trip takes ten days to complete, climbing over 10,000 feet in elevation from the coast to the plateau where the Concordia base was built. Pulled by heavy-duty tractors, these caravans-on-skis carry 150 tons of fuel, food, and equipment each time. These images below show the amazing logistics operating behind this international research base, which is the closest thing on Earth to interplanetary exploration, where the crew are studying the effects of isolation, preparing for a future mission to Mars. Raid arriving at Cap Prud'homme (2012). On 8 November 2013 the first DC-3 plane landed on the Concordia snow strip bringing the first new people and supplies of fresh fruit and vegetables after nine months. A Twin-Otter aircraft has a stopover for refueling half-way to the Concordia research station in Antarctica. The airport is nothing more than a strip of cleared snow and a stockpile of fuel barrels. From the Antarctic coast it is roughly 750 miles to Concordia. Personnel, small equipment, and fresh produce are transported in a twin-propeller plane organized by the Italian PNRA Antarctic program. The aircraft has to be meticulously maintained because it flies at altitudes where the air pressure is a third less than at sea level, in extremely cold weather. The Concordia research station during "summer camp." In summer over 60 scientists arrive at the base, aircraft take off on an almost daily basis. A land expedition arrives at Concordia on March 22, 2013. Three expeditions are conducted by the French IPEV polar institute. Once at Concordia, three days are spent unpacking and preparing for the return trip. The trip back to the coast is generally two fewer days in length, because it is downhill most of the way. A caravan near the Concordia research base? These camels are wooden cut-outs made by former crew members, presumably for fun. The Aurora Australis high over Concordia station on 18 July 2012. During the winter, Concordia is in almost total darkness, with an average temperature of –51°C and a record low of –85°C. It is an ideal place to study the effects on small, multicultural teams isolated for long periods of time in an extreme, hostile environment. But at least there is no need to worry about the supply.